Today's Freeze Dried wild caught Tubifex Worms. Today's unique food is actually tubifex worms processed by the new freeze dried technique. Removal of moisture under vacuum at sub zero temperature. This process preserves the excellent nutritional factors of live Tubifex worms and also preserves their flavour. Without all the fuss and bother. 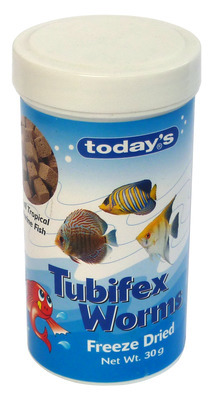 Excellent for all varieties of Tropical Fish, Gold fish, Marine fish and turtle.